New York Yankees manager Aaron Boone is being pretty secretive on who will start the American League Wild Card Game for the New York Yankees on October 3rd, but I think I figured out who will start the game and I am prepared to share my prediction with you this morning on the blog. The game is played on Wednesday, October 3rd and the game will more than likely take place in the Bronx at this point with New York holding a slim lead and the potential tiebreaker advantage over the Oakland Athletics. With that said the game is officially seven days away. Luis Severino pitched on Tuesday night against the Tampa Bay Rays which all but counts him out of the running to start the Wild Card game. I guess the Yankees could pitch him on seven days rest, but it seems like the team is more than likely banking on a Wild Card Game victory and having Severino come back in the ALDS after essentially skipping a turn through the rotation. JA Happ last pitched on Sunday against the Baltimore Orioles, meaning his next turn through the rotation (including the bullpen game on Monday) would be Saturday the 29th against the Boston Red Sox. Without much maneuvering that would leave Happ available on just three days of rest for the Wild Card Game in the Bronx, presumably. Not ideal, and probably not going to happen. Masahiro Tanaka pitched last night and could pitch the game on Wednesday with six days of rest, something he has done exceptionally well throughout his career. Tanaka knows the bright lights of Yankee Stadium and knows what it is like to pitch a game in the Bronx in the postseason and specifically in the Wild Card “win-or-go-home” type atmosphere. To me it makes the most sense for him to make the start on October 3rd for the Yankees, so he is my prediction. 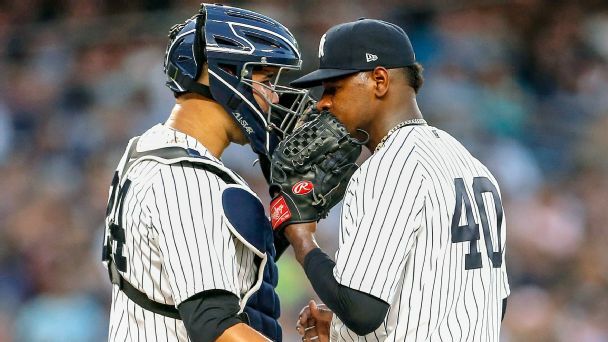 It explains the Yankees bullpen game on Monday and it puts New York not only in the best position to win the Wild Card round, but to compete and win the ALDS against the Boston Red Sox as well.